Sherik Dorje Nӧnpo Gyü, The Sharp Vajra of Awareness Tantra (Tib. ཤེས་རིག་རྡོ་རྗེ་རྣོན་པོའི་རྒྱུད་, Wyl. shes rig rdo rje rnon po'i rgyud) is one of the five Dzogchen tantra termas revealed by Dudjom Lingpa through a pure vision. Being part of the Daknang Yeshe Drawa cycle, the Sherik Dorje Nӧnpo Gyü’s full name is 'The Sharp Vajra of Awareness Tantra, from the Matrix of Pure Appearances and Primordial Consciousness, the Quintessence of the Great Mystery of the Mantrayana, The Primordialy Pure Absolute Space of Samanthabadri, the Spontaneously Actualized Treasury of Liberation’ (Wyl. dag snang ye shes drwa ba las/ ka dag kun tu bzang mo'i dbyings/ lhun grub rdzogs pa chen po'i mdzod/ shes rig rdo rje rnon po'i rgyud/ gsang chen snags kyi yang bcud). The Teacher, Kuntunzangpo appearing as the Lake-Born Vajra, explains to Dudjom Linpa how all the wordly appearanes and mindsets we take to be real actually manifest like apparitions — reified by our grasping—without even an atom of true existence. But the sharp vajra’s power and blessings bring natural liberation, whereby all phenomena are recognized as spontaneously actualized displays of primordial consciousness. To accomplish this level of realization, we are instructed to focus on the essential points of practice, clearly distinguished in succinct terms. 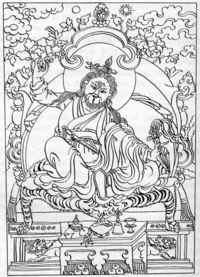 Pema Tashi, a major student of Dudjom Lingpa, composed a 126-page commentary to the Sherik Dorje Nönpo Gyü which is called Drel Chung Dön Sal Nyingpo (Wyl. shes rig rdo rje rnon po'i rgyud kyi 'grel chung don gsal snying po). Nyoshul Khen Rinpoche wrote: "Dudjom Rinpoche studied the tantra Sherik Dorje Nӧnpo Gyü, and the dynamic energy of his awareness welled up as the sublime knowing that discerns the true nature of phenomena. He easily and very naturally understood the difficult points of the vast classes of tantras of the Vajrayana path". Drel Chung Dön Sal Nyingpo, by Pema Tashi. Alan Wallace, Dudjom Lingpa’s Visions of the Great Perfection, Wisdom Publications, 2015, volume 1, page 27-38. ↑ Alan Wallace, Dudjom Lingpa’s Visions of the Great Perfection, Wisdom Publications, 2015, volume 1, page 21. ↑ Nyoshul Khenpo, A Marvelous Garland of Rare Gems: Biographies of Masters of Awareness in the Dzogchen Lineage (Junction City: Padma Publications, 2005), p. 284. This page was last edited on 7 May 2017, at 21:52.